I really wanted to make sugar cookies with my toddler this year and let her use sprinkles, red hots and those weird silver BB-looking things to decorate them when they came out the oven. But then I picture the mess. Sticky red and green sprinkles and silver BB's undigested in my toddler's poop. No thanks. So I came up with a fun way for her to decorate cookies and still maintain my sanity. 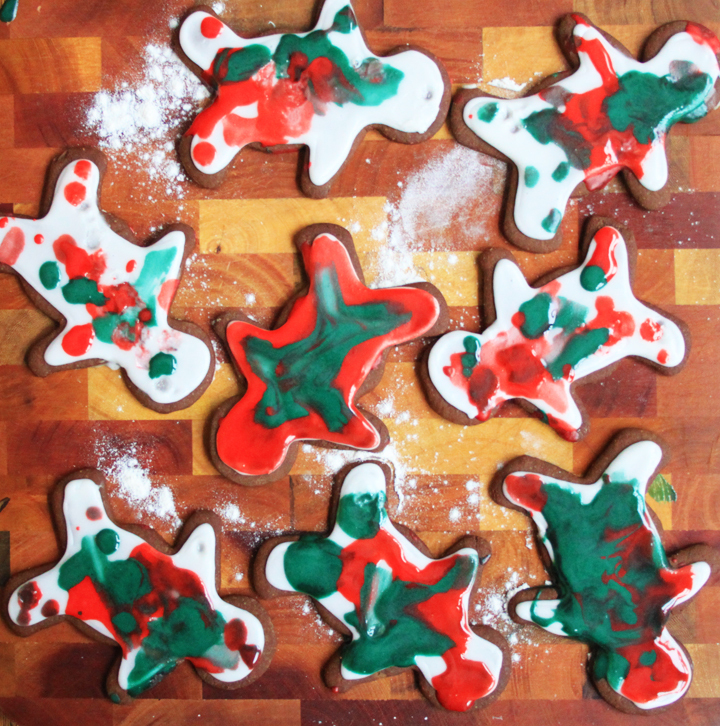 These gingerbread men covered in white icing are the perfect substrate for a toddler's natural artistic skills. 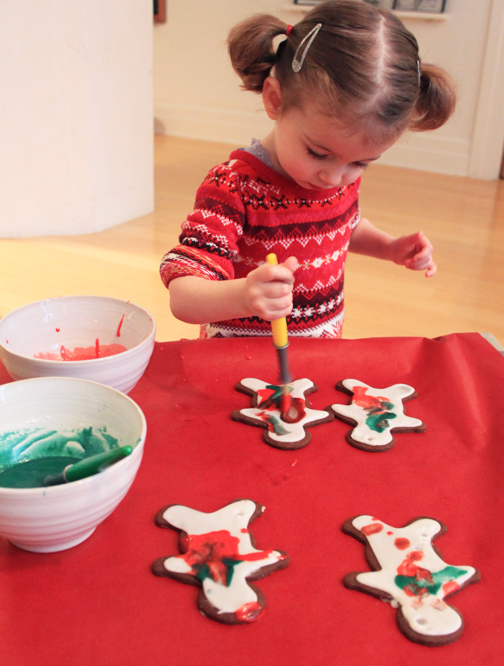 Set out the red and green icing bowls and unleash your toddler's artistic abilities. In a medium bowl, whisk together flour, spices, baking soda, and salt; set aside. With an electric mixer, beat butter and brown sugar until smooth. Beat in molasses and egg. With mixer on low, add dry ingredients; mix just until a dough forms. Place dough on floured plastic wrap; pat into an 8-inch square. Wrap well; chill until firm, 1 to 2 hours. Preheat oven to 350 degrees. Divide dough in half. Working with one half at a time (rewrap and refrigerate other half), place dough on floured parchment or waxed paper; roll out 1/8 inch thick, turning, lifting, and flouring dough (and rolling pin) as needed. Cut out gingerbread men and place on an ungreased cookie sheet. Bake for 12-15 minutes. Let cool completely then pipe a thin line of royal icing around the edge of the cookies. Allow to dry for 3-5 minutes then fill in the rest of the area with icing. Allow to dry for 24-36 hours. Make up a batch of thin royal icing and split into two bowls. Color one bowl red and the other green. Use the paint brushes to make designs on the cookies. What kid doesn't love the story of Rudolph the outcast reindeer, who was kept out of the popular reindeer click until Santa pointed out that Rudolph's defect was actually useful? Harness your child's love for the red nosed reindeer by putting their little hands to work crafting these adorable cookies. Perfect for minimal dexterity because the pretzels, chocolate chips and M and M's are easy to hold and place. Also, even if a few of the faces come out a bit wonky you can use the opportunity to further explain why Santa loves all the reindeer even if their antlers are growing out of their chins. Mix sugars, peanut butter, shortening, butter and egg in large bowl. Stir in remaining ingredients. Cover and refrigerate about 2 hours or until firm. Heat oven to 375ºF. Form dough into 1-inch balls. To make reindeer-shaped cookies, pinch the bottom of the ball slightly to form a point, then gently flatten with your hand. Place cookies two inches apart on an ungreased cookie sheet and bake for 7 to 8 minutes, or until just beginning to brown. Remove from oven and immediately (and gently) press two mini pretzels into the tops of the cookies for the reindeer's antlers. Press two chocolate chips point side down in for the eyes and one red M&M for the nose. These low sugar oatmeal raisin cookies look and taste like the real thing but are actually just a bowl of oatmeal dressed up in a cute little cookie outfit. Even my little cookie monster can't tell the difference. Let them stir in the oatmeal and raisins and spoon them onto the cookie sheet. Then let them eat one, two or seven without the sugar jacked aftermath that normally follows a cookie binge. Preheat oven to 350 degrees. Using a mixer, beat the butter, sugar, banana and syrup together in a large bowl. Add eggs and vanilla and mix until combined. Whisk together the dry ingredients in a separate bowl and slowly add to the wet ingredients, mixing on medium speed. Add the oats and raisins and stir with a large wooden spoon until well combined. Spoon two tablespoons per cookie onto an ungreased cookie sheet and bake on the middle rack for 15 minutes. These cookies are great for keeping it super simple. Rolling out the cookie dough into balls, dipping them in sugar and pressing them with a fork are great for little hands and should keep your toddle interested in the activity for longer than 17 seconds. Preheat oven to 375 degrees F. In a large mixing bowl beat butter and peanut butter with a mixer on medium speed for 30 seconds. Add the granulated sugar, brown sugar, baking soda, and baking powder. Beat until combined, scraping sides of bowl occasionally. Beat in the egg and vanilla until combined. Beat in as much of the flour as you can with the mixer. Stir in any remaining flour. If necessary, cover and chill dough about 1 hour or until easy to handle. Shape dough into 1-inch balls. Roll balls in additional granulated sugar to coat. Place balls 2 inches apart on an ungreased cookie sheet. Using the tines of a fork, flatten balls by making crisscross marks on top. Bake for 7 to 9 minutes or until bottoms are light brown. Transfer to a wire rack and let cool. Makes about 36 cookies. It is tons of fun to bake cookies with your toddler, but you know what isn't so fun? Saying no to their one-millienth request to eat another one of the cookies you just made. These little tea biscuits are great for placating the demanding toddler because they are small, the only sugar in them is maple syrup and if you add the formula the recipe calls for, you can even pretend they are healthy. In a large bowl, cream the wet ingredients with a hand mixer or a mixer fitted with the wire whisk. In a separate bowl, sift together the dry ingredients. Slowly add the dry ingredients to the wet ingredients mixing on medium speed. Mix just until ingredients are well incorporated, don't overmix. Form the dough into a ball and cover with saran wrap. Refrigerate the dough for one hour or more. Preheat oven to 350 degrees. Use a rolling pin to roll the dough out to about 1/4 inch thickness (I like to use parchment paper to keep the mess to a minimum). Use any cookie stamp to cut the cookies into shapes. Place cookies on an un-greased cookie sheet and bake for 20 minutes.